Catherine Lombardozzi has blogged about Collaborative Inquiry, a topic I’ve been skirting for a while with terms like: learning networks, un-conference, collective intelligence, distributed decision making, distributed cognition or connectivism. I think this basic idea is a natural part of web 2.0 thinking that is collaborative in its core nature. I also think it is a way to tap into the knowledge flows associated with Hagel’s Power of Pull thinking and is also just a good way to address knowledge areas that are in flux as opposed to stable and well established. Less and less of our practices are stable today and this is a natural way to gain knowledge and direction. 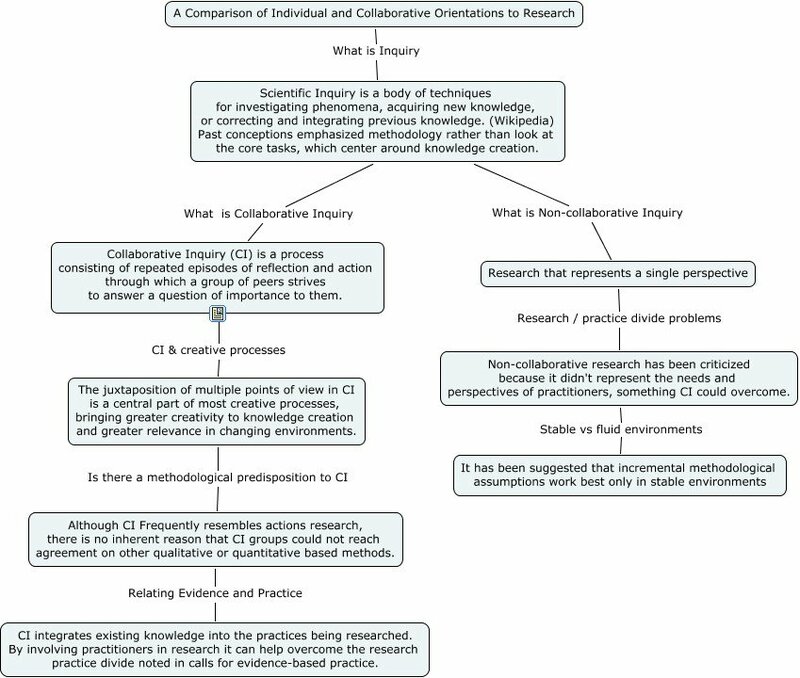 To extend this idea I’ve been thinking about why you would want to choose a collaborative research structure over a more traditional set up, and I’ve put my ideas into this concept map. It’s not a finished product; just beginning thoughts. According to Wittgenstein and Bakhtin, words are instruments of meaning, but that meaning is only realized in the context of their use, not from any kind of essence. (See my previous post for direct quotes and a fuller treatment) I believe this radical pragmatic concept also applies to logos – understood here as language, conversation, proposition, principle, reason, analogy, etc. . . , and I would include knowledge. That is, knowledge is only fully understood and becomes meaningful in the context of its use and in its position between speakers. Furthermore, this sign is not in the head of an individual, but in the network that is the social space for creating joint expression and experience. Our psyche is not in us, but is distributed throughout our cultural historical background and in our shared social spaces. In this way, we are just like words, we develop (ontogeny) and are defined through our associations with others. A new idea is a new network of neurons firing in the brain. But most such ideas are only partial. They become complete when we work on them jointly with others. The process of linguistic coupling extends and completes our new neuronal networks and joins them with other new neuronal networks. These semiotic actions, when at their best, can seem mysterious or even divine in their function. What Would Education Look Like? I’ll answer this question by looking at some vision of education in my next post. In this previous post, I imagined who might be served by a networking organization that was full of smart passionate people who seemed to be functioning together as a learning platform. In general, networks are now being viewed as the new platform for leaning. In this post, I want to consider possible reasons that would account for this phenomena. The rapid pace of change, the growth of knowledge and information, the increased pressure of competition; all of this and more require us to find better ways of learning and improving performance. Knowledge and capabilities can be developed rapidly and a lack of knowledge should never be the deciding factor holding us back. My basic feeling is this. If you can envision an opportunity, a capability to learn and a collaborative network should be ready to help you take advantage of that vision. The way I believe this is playing out is by challenging the core models of how we learn and changing the infrastructure of learning. As an educational psychologist, I want to understand these changing fundamentals of learning. Why are traditional methods of education not enough? Accessing Knowledge Flows – The 1st reason is detailed by Hagel, Brown and Davison’s (2010) recent book, From Push to Pull. Competitive pressures are generally increasing because knowledge stocks, the knowledge that helps to differentiate companies from competitors, is losing value at a faster and faster pace. This is why Hagel et al suggest that we should anticipate change and to think in terms of knowledge flows instead of knowledge stocks. Traditional means of education created courses to pass on knowledge stocks. New forms of education will tap into networks of people to access knowledge flows to stay ahead of competitive change. From Content to Capabilities – Learning is moving from a focus on content (what you know) to capabilities (what you are able to do). Of course, while knowing is a part of capability, it is a necessary but insufficient part. We must set our sights on a wider perspective that shifts from knowledge to the capabilities that are also needed to get things done. I’ll expand on this in a later theoretical post, but capabilities require a holistic performance orientation where knowledge and conceptual tools are intimately linked to tasks through contexts and purpose. From Teaching Knowledge Stocks to Enabling Mediating Conversations – The symbol of learning is changing from the degree (certifying what you know) to a personal learning network (that supports what you can do) that is acted out through multiple conversations. Example – Envision an old style education. A 20 year old student is listening to a lecture and accumulating “just in case knowledge”. This is knowledge that may or may not be needed at anytime during a 40 year career. This may have been adequate in 1800 when the Library of Congress contained all of 3000 books, but not today. Now contrast that with a technologically enabled network of capable peers, each with their own network and with access to many possible forms of knowledge. They are learning in situ, right at the point of need, and their intention is to enable differentiated action today while working in a field that may not have even existed ten years ago. The Site of Learning is the Point of Need – It’s not that the college degree serves no purpose. Developing intellectual maturity and understanding the basic processes and skills across a range of disciplines should help students become productive workers. But, school is not where the majority of learning is going to occur in the future. It will occur on demand, at one’s job, and through a network of high performing peers that together will posse an astounding diversity of capabilities ready to be drawn upon for mutual benefit. Learning does not stop when you are 25, but continues on. In a knowledge flow, you ,ay not even be conscious of the full extent of the learning that is taking place. Developing positive feedback loops in strong local networks. This has been given as a reason as to why place seems to matter even more in this “globally flat age of the internet”. At the end of the previous point I alluded to this aspect of networks. Because we’re focused on capabilities and a holistic way of looking at performance, tacit learning has become very important. Tacit learning refers to things like attitude, emotion, body language, and trust. These things cannot easily be passed on without a face to face relationship, but they are very critical to performance. Even though the internet make distance disappear for explicit communication, it takes face time to enable strong relationships and positive feedback loops that are a major benefit of high performing networks. When exposed to high potential peers with great experience, tacit understanding and ideas that can be emulated, increased potential, motivation and performance come very naturally. People who want their very best need a strong network of high potential peers. 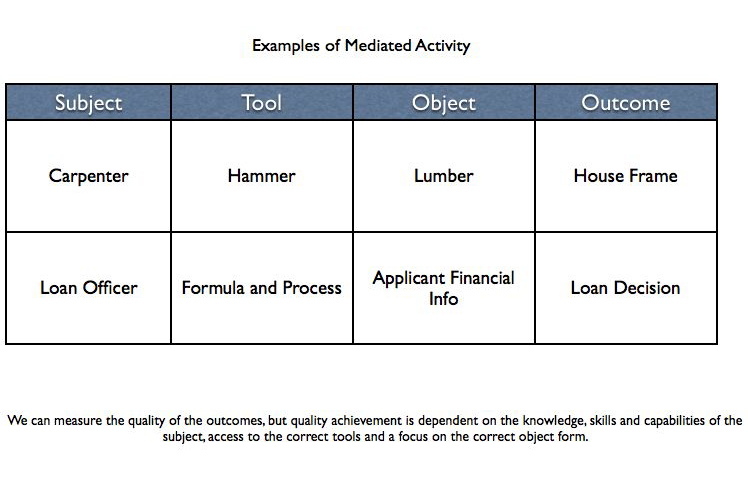 To explain cognitive mediation as the core tools of capability and an important focus for learning. To explore what capabilities are core to business processes and will be important to the future performance and network learning. To explore potential methods for increasing these tools and capabilities and for internalizing these tools into your work practices. A friend was involved with a professional network, GPSEG (The Greater Philadelphia Senior Executives Group) in the Philadelphia area. It is a group for professional networking. There are approximately 1100 individuals registered with the group. Membership can connect with other members for coffee meetings and there are many sub-groupings and meetings organized by locale or by industry. Many people use the group to network for jobs, but they are encouraged to (and many do) remain with the group and continue to network after finding employment. When describing his activities with the group, the words “learning platform” kept coming to mind as a primary goal and function of his activity. I don’t really know much about the group and hope to learn more in the future, but just the idea began sparking my imagination. One of the greatest educational needs for the future is for institutions that can support and actualize adult lifelong learning in ways that is functional for their everyday learning needs. The term “knowledge age” may not be sufficient to the task, but let’s at least say that learning is an imperative for everyone these days. Prepackaged courses and curriculum will not cut it. Networked learning is all the rage, but networks have to start and end with people. It is important that any network be technologically enabled, but it can’t be dominated by IT thinking. I believe it needs to have a local component and a face to face component that is primary. This group is billed as senior executives, and I think this is a very good foundation, but I will put on my educational hat and speculate about who else could potential be served a group like this. High Potentials – A recent Harvard Business Ideacast (Keep Your Top Talent from Defecting) reviewed the work of Jean Martin and Conrad Schmidt who authored the article How to Keep Your Top Talent in HBR (subscription required). What struck me was their figure that 70% of today’s high performers lack critical attributes essential to their success in future roles. What a need for education, but its got to be realtime and relevant learning in real contexts. You can’t have the training department design a course or curriculum to fix this problem. The learning needs are too diverse and unpredictable. Development is also spoken of in this article as an engaging and motivating force for this group. Management may not want to expose their top talent to individuals in other organizations, but these authors say that top talent already knows their value and their place in market forces very well. Entrepreneurs – Most cities have an entrepreneurs development and support organization. In Cleveland it’s call Jump Start. This type of organization could serve as a great screener of people who may not have a job history as a senior executive, but would have such potential. For projects supported by these organizations, a learning platform is exactly the type of support entrepreneurs need as they and their companies grow and develop. Jumpstart has advisors and networking, but I bet it does not alway function as a true learning platform like I’m envisioning. Academics – I don’t know exactly how this would shake out, but academics and the higher education business model needs to get out of class and out of the insular world of researching order to work and interact with this type of group. Academic models need to change and it can only happen with experience and experimentation. I’m sure there more possibilities I should consider, but I’ll leave it there for now and allow more time for my thoughts to develop. Two related ideas, one on learning in educational settings and one for learning in business. 1. Learning in educational settings should only be considered successful if you both learn how to learn and if you are provided with the resources to learn into the future. Most post secondary education is organized around courses that have a beginning and an end with a bounded set of knowledge, but this does not square with the idea of lifelong learning and with the learning demands modern society places upon us. Society is still set up so that first you learn to do and then you are expected to go forth and do, but we are understanding more and more how doing and learning are inexplicability bounded together with one another. It seems to me that courses should end not with an examination, but with a path forward that points out what you don’t yet know and an introduction to a society where that learning can take place. A degree should not give you a bounded set of knowledge, but with an introduction to the flexible outlines of a path and the means to pursue that path. 2. Knowledge is more distributed than we have ever acknowledged and knowledge networks are a key in knowledge development. Business once developed around the idea of a cooperative advantage that comes from locking up and exploiting resources including people and knowledge. Knowledge’s half life continues to stink daily and I’m not sure that the super smart people really ever existed beyond the hype. Today’s business imperative is learning and to do that you must be tapped into broad knowledge and idea flows that only exist in networks. It’s the idea that we are all smarter together than anyone of us individually and we can actualize this intelligence through networks. We are not talking mobs and mob mentality, but we are talking networks where the nodes are smart people full of knowledge, ideas and experience. These ideas are related in this way; if we want our students to have a next generation education, it will require that we put them on a path for lifelong learning, not through courses that never stop, but through learning that is embedded in everyday activities. That takes a different type of resource then we find in the university system. The closest thing we have to that resource are professional networks that are set up to function as learning platforms. (From Bandura) Knowledge transfer in many situations can be seen as a form of learning that proceeds through ongoing modeling with feedback and increasing approximation, not by an explanation of abstract information. Communicator – The concept of EBM is not an outcome, it is the bridge that can close the gap between researchers and practitioners. However, the communicator must stand on this bridge, not on either shore. Message – Standing on the EBM bridge, the most important aspect of research is validity. It is a view of validity that begins with the whole of the concept (not the narrow view of traditional research validity). Research is not valid until the consequence of it use in practice can be demonstrated. See a previous post on validity here although I may need to do additional work on the validity concept. Medium – In the light of Bandura, the real medium of concern, in fact, are the people in the practitioner’s network. Receiver – We need to build up the scope and diversity of practitioner’s networks and the ability of these network to act as learning models for evidence-based practices. Reading about e-learning and social media, I get the feeling that people are trying to solve learning issues with technical applications. While I believe that technology is a key enabler, learning is social at its core. That means social innovation should come first. Social media can be a great enabler, if its application is designed to facilitate interaction where social change has already taken place or at least where the ground is fertile for social change. An individualistic idea of schooling led to a university model where people went to school to get knowledge into their heads and then went out into the world to practice and use that knowledge. But not only is learning not anywhere near finished when you leave school, to be successful in practice many people need to learn everyday. In short, the learning is never done! Yes, we need knowledge from schools, but even more important we need a learning network. This was my take-away from last falls connectivism course (CCK08). Providing students with a network of knowers is more important than providing them with knowledge. While many professors may maintain contact with graduates, what is needed is more. It’s the expectation that graduates will leave school with a strong learning and practice network that includes strong bond to ties graduates back to their original contexts of learning and to ties schools to rich fields of practice and practitioners. It’s a two way street. Now in this type of context, social media can be a real enabler because it is focused on facilitating dynamic social innovation.